USA : Nov. 29 [PST/-13:30hr] 19:30 to 20:30 hr. USA : Nov. 29 [CST/-11:30hr] 21:30 to 22:30 hr. USA : Nov. 29 [EST/-10:30hr] 22:30 to 23:30 hr. UK : Nov. 30 [GMT/-5:30hr] 03:30 to 04:30 hr. AUS : Nov. 30 [AEST/+5:30hr] 14:30 to 15:30 hr. NZ : Nov. 30 [NZST/+7:30hr] 16:30 to 17:30 hr. On this date, JSS Youth asks that all centers around the world schedule one hour long Kirtan Bhakti for our one specifically directed Bhaav – The long lasting health and well being of our most revered His Divine Holiness Param Pujya Shree Kanudadaji. This inspiration came directly from the agna given by PPS Kanudadaji to gather for Kirtan Bhakti each year. 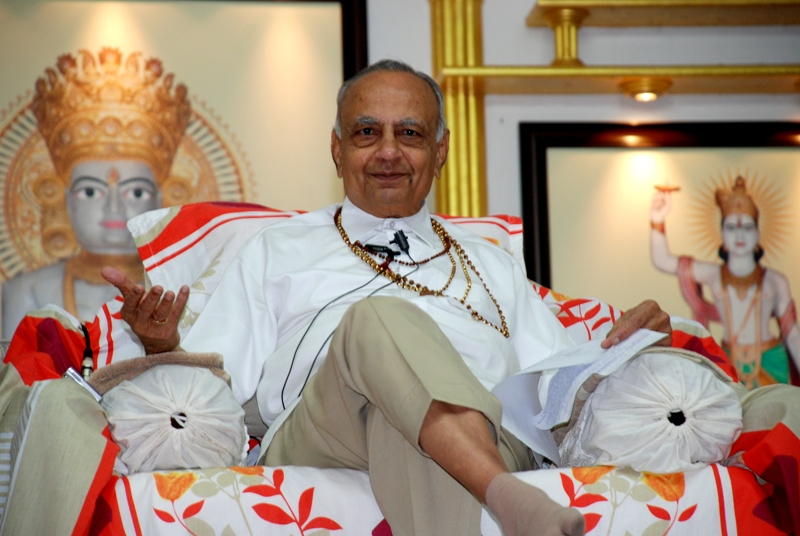 Dadaji has explained many times, that doing Vidhis and Kirtan Bhakti by yourself brings you the fruit of just one prayer. However, doing them with 100 Mahatmas, brings you the fruit of a 100 prayers. So please join us in celebrating this auspicious occasion, united as one Sangh. We request everyone to coordinate with all mahatmas in your region to join Youth and Mahatmas worldwide to participate in the Kirtan Bhakti during the respective time at your region. Jagat Kalyaan Ho! Jagat Kalyaan Ho! Jagat Kalyaan Ho! USA : Nov. 24 [PST/-13:30hr] 02:00 to 04:00 hr. USA : Nov. 24 [CST/-11:30hr] 04:00 to 06:00 hr. USA : Nov. 24 [EST/-10:30hr] 05:00 to 07:00 hr. UK : Nov. 24 [GMT/-5:30hr] 10:00 to 12:00 hr. AUS : Nov. 24 [AEST/+5:30hr] 21:00 to 23:00 hr. USA : Nov. 24 [PST/-13:30hr] 19:00 to 23:00 hr. UK : Nov. 25 [GMT/-5:30hr] 03:00 to 07:00 hr. AUS : Nov. 25 [AEST/+5:30hr] 14:00 to 18:00 hr. NZ : Nov. 25 [NZST/+7:30hr] 16:00 to 20:00 hr. USA : Nov. 22 [PST/-13:30hr] 19:30 to 20:30 hr. USA : Nov. 22 [CST/-11:30hr] 21:30 to 22:30 hr. USA : Nov. 22 [EST/-10:30hr] 22:30 to 23:30 hr. UK : Nov. 23 [GMT/-5:30hr] 03:30 to 04:30 hr. AUS : Nov. 23 [AEST/+5:30hr] 14:30 to 15:30 hr. NZ : Nov. 23 [NZST/+7:30hr] 16:30 to 17:30 hr. USA : Nov. 21 [PST/-13:30hr] 02:30 to 04:30 hr. USA : Nov. 21 [CST/-11:30hr] 04:30 to 06:30 hr. USA : Nov. 21 [EST/-10:30hr] 05:30 to 07:30 hr. UK : Nov. 21 [GMT/-5:30hr] 10:30 to 12:30 hr. AUS : Nov. 21 [AEST/+5:30hr] 21:30 to 23:30 hr. USA : Nov. 20 [PST/-13:30hr] 02:30 to 04:30 hr. USA : Nov. 20 [CST/-11:30hr] 04:30 to 06:30 hr. USA : Nov. 20 [EST/-10:30hr] 05:30 to 07:30 hr. UK : Nov. 20 [GMT/-5:30hr] 10:30 to 12:30 hr. AUS : Nov. 20 [AEST/+5:30hr] 21:30 to 23:30 hr. If you are straight forward the world is straight. If you are wicked the world is so with you. In absolute reality the world is always innocent.